In the period from 1599 to 1606, the painter Caravaggio painted two paintings on the same gospel plot – after the resurrection Jesus is the two disciples. Cleopas and another man, whose name is unknown, after the execution of the teacher of Christ were sent from Jerusalem to the place of Emmaus. Along the way, the students of the mysterious traveler met, talking with him about recent high-profile events. Gradually, it was dawning, so they offered the new acquaintance to stay with them in the inn until the next day. 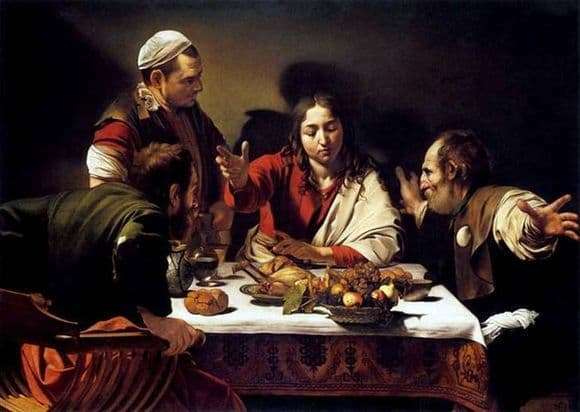 The artist’s canvas depicts the moment of dinner at the hotel, and more specifically, the second time the apostles recognize their deceased mentor, the Son of God, by the apostles. Jesus recognized men by the symbolic gesture of blessing with the hand of food. Cleopas (sitting with his back to the viewer) from unexpectedly agitated strong emotions – a mixture of surprise, fright and joy, seized the arms of the seat and got up from his seat. The second follower of Christ spread his arms to the side with delight. The third character – the owner of the house, does not see anything supernatural, because they do not understand the conversation of their guests. Everything in the canvas is permeated with deep symbolism. Cooked game on a white tablecloth and dark grapes are a sign of death. White grapes and pomegranates are positive symbols of life and resurrection. The apple is a reminder of the sin of the first people and his atonement by the incoming Messiah. Bread with wine – Eucharistic objects. Shell on the clothes of the student – a symbol of the pilgrim. The uniqueness of the image in the non-iconographic image of Christ: a face without a beard and full. For the rest, the artist tried to make the plot realistic by artistic means, so that the beholder felt himself to be a participant in this dinner and a divine phenomenon. Connoisseurs of creativity Caravaggio recognize that the conceived master managed to implement.